Who says bathrooms can’t be fun? 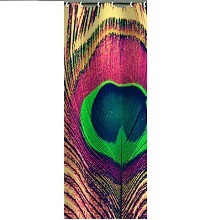 To get the most bang for your buck, start with an artistic, inventive DENY Designs shower curtain in Peacock pattern. The DENY Designs has got endless options like this shower curtain that will really make your bathroom pop. Heck, your guests may start spending a little extra time in there because of it!